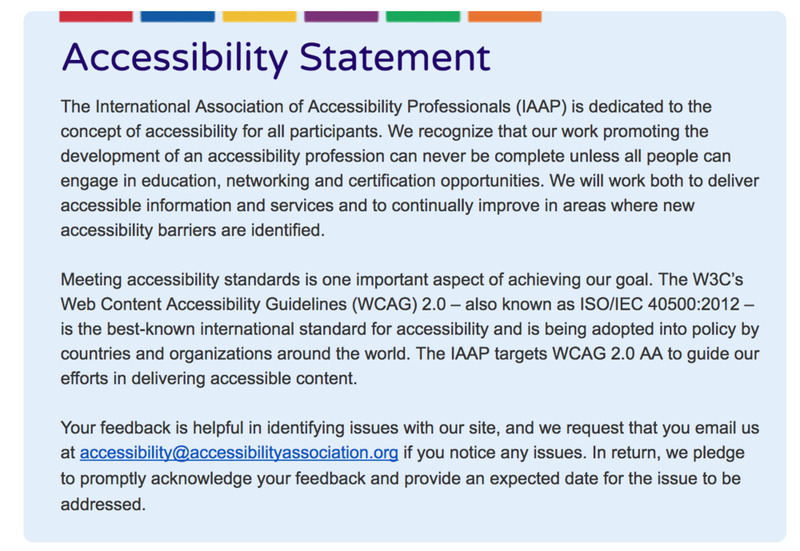 It's not remarkable that the Atlanta, Georgia-based International Association of Accessibility Professionals has an accessibility statement on the home page of its website. It's remarkable that so many associations don't. Thank you, IAAP, for showing us that we need to do better in making our own web and meeting sites accessible -- and in publicizing that. You surely are bringing your accessibility 'A' game. Does your association do this? Send us an email, and we'll update this post! Bringing Their A Game is an association-management ideas blog for associations managed by association management companies, staffs, contractors and volunteers. Read all the posts. Subscribe to the weekly email. Follow us on Facebook & Twitter.